Made these and they are wonderful!!!! Sift flour, soda,salt,cocoa,and sugar together. Beat eggs slightly. Add milk and vanilla. Combine with the other mixture. Finally, add oil and mix well. drop by tablespoon on greased pan (you can drop more if you want larger pies). Bake at 350* for 10 minutes. Beat butter, Crisco, sugar and vanilla with electric mixer. Fold in marshmallow fluff. 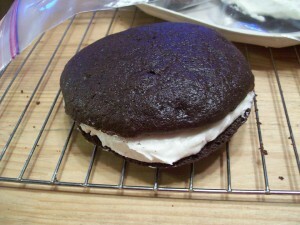 Spread between Whoopie Pie cakes.